Shooting 2D movies is so 2015. It's all about VR. Okay, we are possibly exaggerating a little, but the ability to shoot your own immersive flicks is not just for the pros anymore and that's exciting. We've seen Facebook announce a 360 degree camera and earlier this year we got up close with the $200 LG 360 CAM and the Samsung Gear 360. We can even look forward to pocket sized cameras like the Luna to making it easier to shoot spherical flicks on the move. YouTube is opening its doors to 360 degree videos as Wevr makes big plans for virtual reality videos too. 2016 won't just be about playing games on the Oculus Rift, Vive and PlayStation VR, you'll also be able to make stuff your friends can watch in VR. With that in mind, we take a look at what the tech world has to offer in the 360 degree camera space including one that feels well out of reach for most of us. Samsung pretty much nailed it with the Gear VR, offering a great halfway house between Google Cardboard and high end VR headsets like Vive. Now it's turning its attention to help you make the videos and there's not a rig in sight. The Gear 360 uses two 180 degree fisheye lenses, each with 15 megapixel sensor,s allowing the camera to shoot two super wide videos or images at once. The footage is stitched together inside a companion app and can be shared to Facebook or YouTube. There's also dedicated mode to relive the action on the Gear VR. Samsung hasn't priced the Gear 360 yet, but it's safe to assume that it's going to be a whole lot cheaper than the cameras below, making it far more accessible as well. We're not talking about the two working together but both have recently unveiled 360 degree camera rigs that are aimed at the professionals. 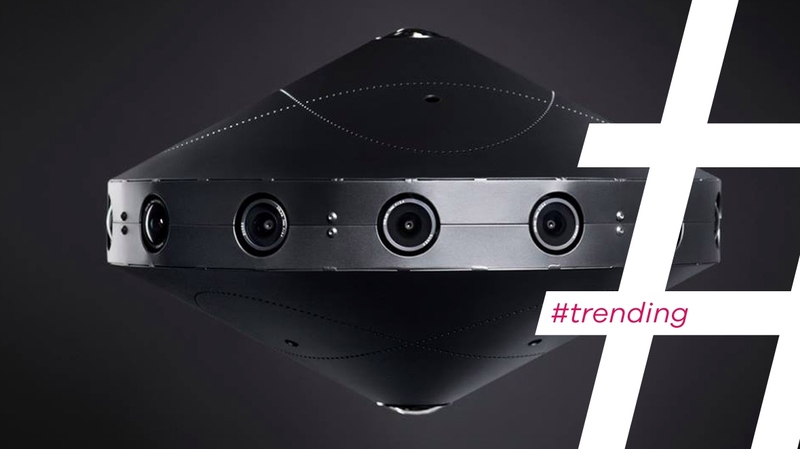 Zuckerberg and co revealed the Surround 360 rig, which is capable of shooting 8K resolution video, is made up of 14 cameras, and two fish-eye cameras to point above and below to create a truly spherical video. Facebook has decided that it's going to make the accompanying software and hardware designs open source allowing anyone to tinker with it to help shoot footage. You just need to have the $30,000 spare to pay for the components. Meanwhile, GoPro announced the Omni, a rig that uses 8 of its Black action cameras and works out roughly to cost about $3,000. It also unveiled the Odyssey rig, that uses 16 GoPro cameras last year with Google. That works out to about $3,00o if you bought those cameras separately. The problem is, GoPro hasn't slapped the Omni with a price, revealed when it will be available or shown off the official specs. So what's the hold up GoPro? In fairness, the OZO could be the best of all the VR cameras and that's because it's only built for professionals. When we say professionals, we mean Hollywood. The Nokia Technologies team is not making it for the wannabe James Camerons and Ridley Scott's of this world. This is for the A-Listers. That also means it comes at a premium and that price is a hefty $60,000 making it double of what will cost to buy the Facebook camera. Nokia's not ruling out a consumer version entirely, but for now it's firmly focused on being on the big screen and not a YouTube 360 degree video sensation.